A classic for financial analysis. What is the HP 12C Calculator? The HP 12C Calculator is a financial calculatorTop 3 Financial CalculatorsFinancial calculators are important investments for anyone who needs to perform specific financial functions that standard calculators can’t handle. For produced by Hewlett Packard that uses reverse polish notationOtherArticles covering other finance topics ranging from Warren Buffett to hedge fund strategies. These other finance topics are an interesting read. Additionally, the HP 12C is widely known as the gold standard for calculators used in the banking and financial services industry. First released thirty years ago, the HP 12C is highly favored by bankers, stockbrokers, and investment managersInvestment Banking Career PathInvestment banking career guide - plan your IB career path. Learn about investment banking salaries, how to get hired, and what to do after a career in IB. The investment banking division (IBD) helps governments, corporations, and institutions raise capital and complete mergers and acquisitions (M&A). Analysts work 100 alike. The calculator performs all basic mathematical functions, with the addition of being able to calculate simple financial formulas as well. The HP 12C comes equipped with the ability to calculate net present value (NPV), internal rate of returnInternal Rate of Return (IRR)The Internal Rate of Return (IRR) is the discount rate that sets the net present value of an investment equal to zero. This guide to calculating IRR will give several examples and who why it's used in capital budgeting, private equity and other areas of finance and investing. If IRR is greater than cost of capital, (IRR), Uneven Cash Flows, Discounted Cash FlowsDCF Analysis InfographicHow discounted cash flow (DCF) really work. This DCF analysis infographic walks through the various steps involved in building a DCF model in Excel., and other financial metrics. The HP 12C comes in two flavors: the regular edition and the platinum edition. Functionally, they are quite similar, although the platinum edition comes with a few extra tricks up its sleeve. HP has also released several limited-edition models of the HP 12C to commemorate milestones in the product’s life. There are, for example, the HP 12C 25th Anniversary Edition and the HP 12C 30th Anniversary Edition. Both models have a limited-edition serial number stamped on the back, and the respective anniversary edition number labeled on the front. Unlike regular calculators, the HP 12C uses reverse polish notationReverse Polish Notation (RPN)Reverse Polish Notation (RPN) is a type of calculation notation. RPN is useful for long-form calculations, due to its efficiency and speed. 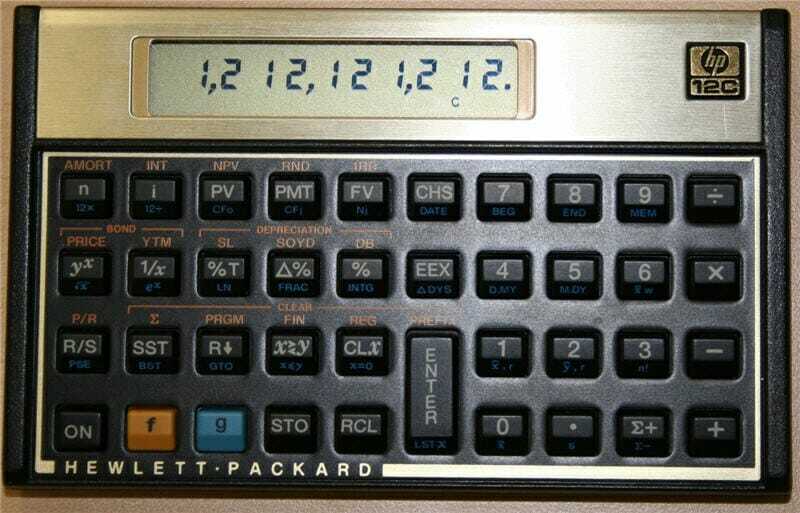 Financial analysts may use an RPN calculator such as the HP 12C. Polish and reverse polish notations place the operator on either side of the numbers. Polish notation would or RPN. While there is a short learning curve required in learning how to operate an RPN calculator, the benefits of using it are phenomenal, as RPN is significantly more efficient for long-form calculations than a standard calculator that uses infix notation. What is the alternative to the HP 12C? When considering calculators for financial analysis, the only other option is the Texas Instrument BAII Plus, also known as the TI BA II plus. This calculator does not use RPN. Instead, it uses the traditional algebraic – infix – notation common to most calculators. It is able to perform the same financial calculations as the 12C, but not as efficiently. Selecting between the two is largely a matter of personal preference. The TI BA II plus will feel more like operating a regular calculator, as they hold a similar shape and operate in the same fashion. The 12C is, instead, wider than it is tall. Additionally, the RPN calculations are more difficult to learn at first but are quite intuitive once you get the hang of it. In reverse polish notationOtherArticles covering other finance topics ranging from Warren Buffett to hedge fund strategies. These other finance topics are an interesting read (RPN), the operator in a calculation comes after the numbers. For example, to calculate 3 x 4 in a regular algebraic calculator, the buttons to press are 3 [X] 4 [EQUALS]. In contrast, on an RPN calculator, the buttons to press are 3 [ENTER] 4 [X]. Pressing X runs the multiplication function on the two preceding numbers. The benefits of RPN are not always easily seen in smaller calculations but they become more apparent when handling longer calculations. Is an MBA worth it?Is an MBA worth it?If you're thinking of going to business school you may be asking, is an MBA worth it?. The answer (as in every MBA class) is: "it depends". Other than the workload of doing an MBA, there is almost no reason not to do an MBA if your boss is paying for it. They may use it as leverage against you and lock you in, but the ROI is incredible if it's free (obviously).